This is about my TERRIBLE experience with customer support of PayPal Prepaid MasterCard. I needed to contact them because some of my purchases didn’t reflect towards cashback rewards correctly. There were two offers involved with the problem. First, it is Kmart. They offered 5% cash back, up to $10 for purchase at Kmart, in store only. The previous one was only a one-time deal, but the offer from last month allowed you to make multiple transactions. I made several transactions at Kmart that sums up more than $200. However, some transactions didn’t count for cash back, and the website didn’t show pending cash back. I sent a message to customer support through the website. Misunderstandings made me send extra&extra messages until I got them to understand the problem. Their responses were quick. I thought they were reliable at least at that time. It concluded that they asked me to wait for the next statement to close. Pending cash back rewards show up a few days after the transaction, but they are actually credited at the end of the following month. They wanted me to wait until then. Time passed. With no surprise, missing cash back wasn’t credited to my account. So, I sent a message again. I made three transactions at Kmart in September. Those transactions were made during cashback rewards promotion. One of the transactions reflected towards the promotion, and cash back for this transaction was posted my account at the end of this month. But other two transactions were not. Last month, I already noticed this and contacted to customer service. And I was told to wait until the end of the following month and contact you again if cash back was actually not credited. Now, I can see that cash back for two transactions didn’t credit to my account. Please check. They always responded in time, which it is shown in their website (within 48 hours.) But, that’s all good thing about them. The first email says, “Congratulations, you earned the rewards, and they are successfully posted to your account.” I replied and specified the problem. The second email says the same thing. I gave up resolving via email and called the customer service. I called, but I couldn’t even get him to understand the problem. He just kept saying my account balance, and amount cash back posted, etc. He never tried to understand the problem. After around 10 minutes of talking, all of sudden, my call went back to answering machine (which I came from before reaching to rep, like press 1 for the balance, press 2 for…..) I proceeded and then reached to the next rep, but no luck. After speaking with the second rep for about 10 mins, it went back to the answering machine again. There was no resolution. I believe the second rep didn’t understand the problem, either. I sent email, but the responses were similar. I didn’t bother to call again. It was very frustrating. What I didn’t receive was only $8.11. It seems I need to give up because the customer service is not helpful, or they are so stupid that they can’t do a very simple calculation. While I was trying to resolve the problem, another Sears and Kmart offers showed up! These are very good offers, but I will have to avoid the same problem as I just experienced. As long as I redeemed an offer with a single transaction, I have never had the problem. And I found the pattern which transaction would be potentially the problem. As you see, the first transactions of each month have no problem. If you make multiple transactions in the same month, second, third, and later transactions won’t be tracked for cash back rewards. I guess this is it. It was a technical problem. And, maybe it will happen if I make multiple transactions in a month. So this time, I will redeem the current offers with a single transaction. I had a discovery about cashback rewards. 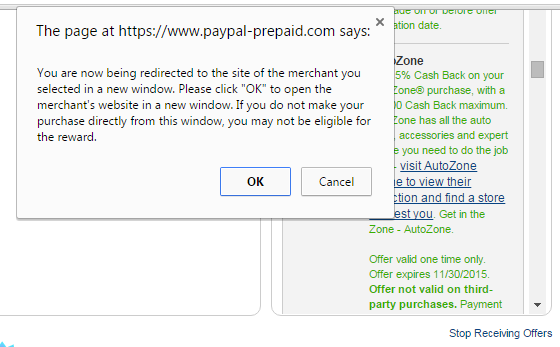 For the first time, I got cash back reward for the online purchase without click a link of PP Prepaid website. There is a clickable link for each offer. When you click, the following message pops up. It says “may not”, not “will not.” So, with a hope of receiving both cash back from portal and PP prepaid, I clicked a link of shopping portal site instead. I have tried the same thing before for 1800flowers’ purchase. For that offer, it wasn’t successful. So, I didn’t expect much this time, but as long as they say “may not”, it’s worth a try for other stores’ offers. I tried this for the offer of 10% back Advance Auto Parts (up to $10). And this time, it was successful. Of course, they are not yet confirmed and possible to be canceled. But for now, there are pending cash back in PP Prepaid website, and I received an email from a shopping portal site. I have three cards, Kmart offers are available on all cards. Sears offer is available on my oldest card only. I wonder what is the requirement for receiving Sears offer. There are many other offers, Restaurants, Sports Authority, Auto Zone, Peapod by Stop & Shop, etc. If you’d like to know other benefits of PayPal Prepaid MasterCard, click here.